Cleanpart is a provider of advanced engineering services to the semiconductor industry. The company maintains process-critical components in machines that are primarily used in the production of logic chips, memory chips and comparable components. These components must be regularly decontaminated, cleaned and coated to ensure that they meet the extreme purity and performance requirements in the production processes of chip manufacturers. The components are serviced at the company’s own facilities, which are located near major customers in Germany, France and the US. Cleanpart has 420 employees and generated revenues of nearly EUR 50m in 2017. 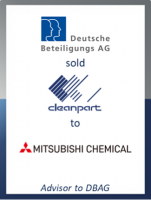 DBAG and DBAG Fund VI invested in Cleanpart in April 2015 as part of a succession solution for the company.